I always chuckle to myself when people say they have TMJ. I chuckle because, technically speaking, everyone has TMJ - the temporomandibular joint. Then, after listening to their list of symptoms and chief complaints, I educate them on TMD also known as Temporomandibular Dysfunction. Many people do not seek treatment for TMD and those who do seek treatment usually go to a dentist. Physical therapy can be extremely beneficial in the treatment of TMD, but unfortunately, this not a well-known fact. This tiny joint residing on the side of our face can wreak havoc if dysfunctional. Yet, many physical therapists do not know how beneficial their skill set can be in the treatment of TMD. Many of my colleagues have stated that they either had one class during their entire PT curriculum on TMD, or that their curriculum did not cover it at all. With that being said, if a patient comes into your office with a referral saying “TMD eval and treat”, don't panic. I am here to help. In PT school, I had a professor that frequently said, “If you know your anatomy, then you can treat anything." TMD is no different - knowing the anatomy is crucial. Normal depression values for women range from 50-55 mm and 40-45 mm for men. Typical chewing requires 18 mm, so if you have a patient with decreased depression then you can utilize your phenomenal manual therapy skills to improve that range (see the management section below). Norms for protrusion and retrusion are 6-9 mm and 3 mm respectively. Lateral excursion should equal ¼ of total depression or mouth opening. Still with me? This may be the most boring part of this post, but bear with me. Now that we have covered the basics of osteokinematics, let's roll onto arthrokinematics (pun intended). There are 2 motions occurring at the TMJ during depression: rotation and translation. Rotation occurs during the first part of depression, whereas translation occurs toward end range. Protrusion requires the TMJ to translate anteriorly and retrusion requires the joint to translate posteriorly. Lateral excursion (this one is a little tricky to remember) involves same side spinning with opposite side translation. The masseters (deep and superficial heads) perform protrusion and elevation. The temporalis also performs elevation, as well as retrusion and lateral excursion. It is important to know that the same side temporalis, opposite side inferior head of the lateral pterygoid, and the contralateral medial pterygoid work together to perform lateral excursion. Speaking of the medial pterygoid, this muscle performs protrusion and elevation. The lateral pterygoid is comprised of the inferior and superior head. The inferior head helps with depression, protrusion, and lateral excursion, while the superior head performs elevation. 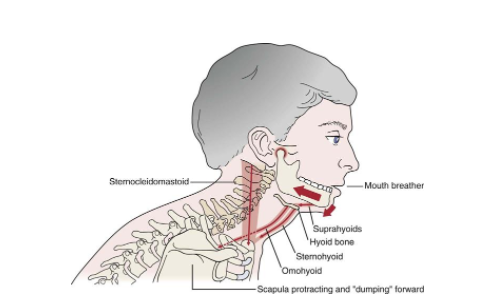 Last but not least, the suprahyoid muscle performs depression and retrusion. Time to evaluate and treat! The most common complaint from those with TMD is jaw and face pain. This one is pretty much a no brainer. Joint noises, such as clicking, popping, and locking may also be present with complaints of pain. Headaches, neck pain, toothaches, and decreased mouth opening are also very common symptoms. In severe cases, dizziness/vertigo, ear symptoms (pain, fullness and/or ringing), speech difficulties, or swallowing difficulties may also be present. First, the muscles of chewing are located near muscles that insert into the middle ear, which can have an effect on hearing and potentially cause a ringing sensation. Second, there can be a direct connection between the ligaments that attach to the jaw and one of the hearing bones that sits in the middle ear. Third, the nerve supply from the TMJ has been shown to have connections with the parts of the brain that are involved with both hearing and the interpretation of sound. By the time a patient with TMD is referred to a physical therapist, it is possible that their condition has been mismanaged up to that point. Therefore, a detailed history is imperative. When did the symptoms start and how? What types of treatment have you had? What makes your pain better? What makes it worse? Do they have any habits like biting nails, grinding teeth, etc.? Once you have a thorough history, start collecting your objective data. Observe the patient’s posture, including facial shape/features and speech pattern. Measure the range of motion of their TMJ (you can use a regular ruler to measure). Note their movement pattern, symmetry, and deviation or deflection. Is there clicking or popping in their jaw? Is it audible or not? If the patient reports this, but you cannot hear it, you may be able to feel it at the joint. However, you can always use a stethoscope to gain a better appreciation for the noises that may be occurring within the joint. Now it is time to break out the gloves. Say what? Yes, get out the gloves - because when you palpate the TMJ and the surrounding musculature you will do so outside and inside the mouth. This may be off putting to some but it is 100% necessary. You can only access the pterygoid muscles from inside the mouth. Also, the masseter musculature is so thick that you only access a small portion of the muscle if your hands remain on the outside of the mouth. Assessing joint mobility to determine whether the TMJ is hypomobile or hypermobile will have to be performed inside the mouth as well. To conclude your objective examination, assess the patient's cervical spine as well as their upper extremities. It is very common for a patient with TMD to also have a cervical pathology. Assessing cervical and shoulder range of motion and passive accessory joint mobility can give you very valuable information that will help you establish an effective plan of care. Now that you have obtained all of the necessary information from your evaluation, it is time to develop your assessment. There are 4 main categories that your TMD patient may fall into: Articular, Arthritic, Muscular, and Postural. The most common articular pathologies include anterior disc displacement with reduction (ADDwR), anterior disc displacement without reduction (ADDwoR), hypermobility, hypomobility, capsulitis, and dystonia (S or C curve). Anterior disc displacement with reduction or ADDwR is commonly described as jaw pain with reciprocal clicks upon opening and closing. Mouth opening may or may not be limited and an S curve where the mandible deviates to symptomatic side may also be present. Anterior disc displacement without reduction or ADDwoR is characterized by a history of reciprocal clicks/locking, the absence of joint noises, and a C curve where the mandible deflects to the symptomatic side during opening. Mouth opening may or may not be present in a patient with ADDwoR. Hypomobility is defined as less than 30 mm of opening and may be due to arthritis. A patient with a hypomobile jaw may report pain and stiffness as their chief complaint. Hypomobility is often a result of recent dental procedures or surgical procedures on the jaw itself. Hypermobility is defined as more than 50 mm of opening and may be found in the presence of certain comorbidities such as Ehlers-Danlos Syndrome and Marfan's Syndrome. Capsulitis occurs when the joint capsule is inflamed and stretched. Symptoms can be aggravated by protrusion or lateral excursion of the mandible, contralateral chewing, and excessive opening. Capsulitis also presents with palpable tenderness or pain directly over the TMJ with or without the presence of swelling. The types of arthritis that may be present in the TMJ are osteoarthritis, rheumatoid arthritis, and psoriatic arthritis. The patient does not have to be “older” to have arthritis. I have had a few patients in their 30s who present with arthritis in the TMJ. Muscular based jaw pain is also very common. The patient’s pain originates from myofascial structures in the form of trigger points. Active trigger points in the masseters and temporalis can refer pain to the teeth, forehead, zygomatic arch, ear, lateral mandible, and temporal bone. A trigger point in the trapezius muscle can refer pain to the eyebrow, temporal bone, occiput, lateral mandible, lateral aspect of the neck, and the upper trapezius area. The sternocleidomastoid (SCM) can refer pain to the ear, forehead, eye, lateral face, crown of the head, and posterolateral aspect of the head. The medial pterygoid can refer pain to the TMJ, ear, and the posterolateral aspect of the mandible. A trigger point in the lateral pterygoid can refer pain to the TMJ and zygomatic arch. Posture! Posture! Posture! As physical therapists, we cannot stress this enough. Forward head posture (FHP) not only wreaks havoc on our cervical spine - it can significantly disturb the TMJ as well. When we sit with our head forward, our mandible is pulled inferiorly and posteriorly, placing unnecessary stress on the disc and the posterior ligaments. This facilitates an opening force on the TMJ and forces the mouth closing muscles to work much harder than they would normally have to. The suboccipital musculature becomes tight, contributing to upper cervical hypomobility and causing referred pain to the face and head. Increased neck pain and tension leads to increased grinding. Increased activation of the SCM, which occurs with FHP, causes increased activation of the masseters. Phew! What a mouth full! Now that can be really difficult to relay to a patient. This is when I find a picture to be worth a thousand words. A physical therapist’s goals for the treatment of TMD should include patient education, relieving symptoms, restoring proper kinematics of the TMJ, restoring oral function, and improving overall well being. Now that we know poor posture can contribute to TMD, the first thing a physical therapist needs to address is proper posture in all positions including sitting, standing, and walking. The next piece of the management pie is everyone’s least favorite: the dreaded soft diet. A soft food diet is an important part of treatment for TMD and is also the most challenging for patients to comply with. A soft food diet minimizes stress on the TMJ, surrounding musculature, and other supporting tissues. Tongue Clicking: make a clucking type sound with your tongue against the roof of your mouth. Controlled TMJ Rotation on Opening (midline opening): place the tip of your tongue on the roof of your mouth, keep the tongue in place as you open your mouth. The tongue position helps to sub maximize opening. Do not push the tongue into the roof of your mouth, just keep it in place. Mandibular Rhythmic Stabilizations: apply resistance to opening, closing, and lateral deviation with the jaw in the resting position. Upper Cervical Distractions: perform upper cervical flexion while stabilizing the cervical spine with your hands clasped together. Then distract the occiput from the atlas. Axial Extension of Cervical Spine: the basic “chin tuck”, recruiting the deep neck flexors and creating length in the posterior aspect of the neck. Shoulder Girdle Retraction: the ever popular “scap squeezes”, retracting and depressing the scapulas. Physical therapists have some pretty sweet manual therapy skills and treating TMD is the perfect opportunity to utilize those skills. Performing soft tissue mobilizations, myofascial release, and trigger point release techniques for the treatment of TMD is supported by the literature. Performing joint mobilizations at the TMJ to restore proper kinematics of the joint has also been shown to be effective. It is also important to instruct your patient to perform some sort of aerobic exercise on a regular basis (walking, swimming, hiking, cycling, etc). Aerobic exercise helps to strengthen our immune system and decreases stress, anxiety, and depression. If necessary, relaxation techniques, such as diaphragmatic breathing and Tai Chi may be utilized as well. In my professional opinion, modalities have their time and place. Meaning, they are not usually my first line of defense. However, with my TMD patients, I am much more likely to break out those “old school” modalities. The literature has supported the use of ultrasound, heat/cold, TENs, laser, phonophoresis, and iontophoresis in the treatment of TMD. As physical therapists, we want to be the ones to “fix” our patients. However, TMD is/can be multifactorial, therefore a team approach may be required. Knowing when to refer out is a crucial aspect of TMD management, and not referring out when it is warranted does an unnecessary disservice to your patient. Medical, dental, surgical and psychosocial interventions may be necessary for your patient with TMD. Forms of medical management may include pharmacology, injections (botox, cortisone, hyaluronate), acupuncture, and topical analgesics. Treatments that a dentist may utilize include occlusal adjustments, splint therapy, or various orthodontic treatments. Common surgical procedures include but are not limited to, arthroscopic surgery (arthrocentesis, arthroscopy, arthrolysis, levage), open joint surgery (discectomy, disc replacement), and orthognathic surgery (complete repositioning of jaw bones). Various forms of psychosocial interventions also exist for TMD. Some of the most commonly used are biofeedback, meditation, stress management, psychotherapy, and Cognitive Behavioral Therapy (CBT). I realize I have just given you a great deal of information. To help clarify what you have learned from this post, I suggest referring to your kinesiology textbook from PT school (I have Donald A. Neumann’s text). 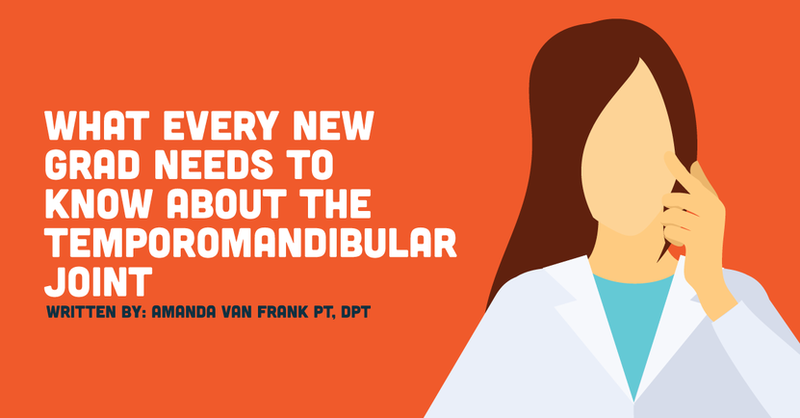 Another helpful resource is Current Concepts of Orthopaedic Physical Therapy: The Temporomandibular Joint by Sally Ho, PT, DPT, MS, OCS. The ability to evaluate and treat TMD is a great skill to have and makes you very attractive to potential employers. Trust me, I speak from experience.